G.T. 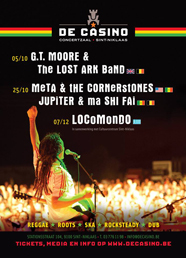 Moore & The Lost Ark Band will be playing at Concertzaal DE CASINO, in Sint Niklaas (Belgium) on Saturday the 5th of October. Joining in on this night is special guest and old friend of Gerald: James Lascelles (Frank Zappa/L. Shankar) on keys and hammer dulcimer! Doors: 20h Start: 21h | Presale: €12 (€15 at doors) Also on the bill earlier on the evening is the Antwerp based reggae band Heartwash.